Blending the magnificence of the natural beauty of the Stellenbosch mountains and vineyards, and sculptured greens at an international standard golf course. 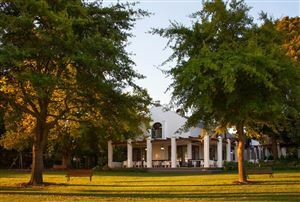 Devonvale Country Lodge emanates the true ambiance of the country living. 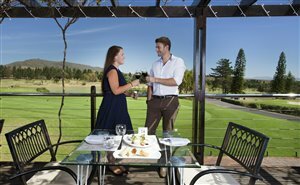 The Lodge is built near the clubhouse with magnificent views over the vineyards, the surrounding mountains and the golf course. There are 30 units varying in size and in total the lodge can accommodate up to 120 guests. The ground floor units lead out onto the garden / pool area while the first floor units have balconies facing the Simonsberg mountains to the east or sunsets to the west. The self-catering apartments have either one or two bedrooms (twin or double bed), kitchenette, television and dining area. There are barbecue facilities available for guests to use on those idyllic summer evenings! The Hotel rooms were designed for the folks down on business who spend too much time at work and need a cosy spot to rejuvenate. Challenging 18-hole Championship Course with spectacular views that stretch all the way to Cape Town! The Proshop is well stocked with everything from rental clubs to golf shirts and logo balls! The course is surrounded by the peace and tranquility of the winelands. At the spa you can be pampered for the ultimate rest and relaxation. After the game you may enjoy a cold beer or a glass of wine on the balcony, watching the sun moving behind the horizon. We have a restaurant, which is open for lunches seven days a week, so why not join us for a meal! We provide laundry services and you are welcome to make use of our swimming pool facilities. All guest staying at the hotel receive a discounted rate on Golf. There is a restaurant on the premises to treat your taste buds from breakfast, lunch to dinner. We also have a spa for you to be pampered and to help you relax. For activities or events in the area you can contact us. We can make bookings for you, rent a vehicle or give general information about the area and surroundings. 2 Bedrooms, 2 bathrooms, a small kitchenette, a lovely lounge/dining area with a/c which leads to a balcony. Sleeps - 4 pax - single beds - double on request. Price subject to 4 people sharing. 2 Bedrooms, 2 bathrooms, a small kitchenette, a lovely lounge/dining area with a/c wich leads on to a small private garden. Sleeps - 4 pax - single beds - double on request. Price subject to 4 people sharing. Fully furnished house - 2 bedrooms upstairs and upmarket living area downstairs. Fully fitted kitchen with washing machine. Patio furniture and braai facilities Price subject to 4 people sharing. 1 Bedroom with an en-suite bathroom. TV and aircon facilities. No access to a balcony or garden. 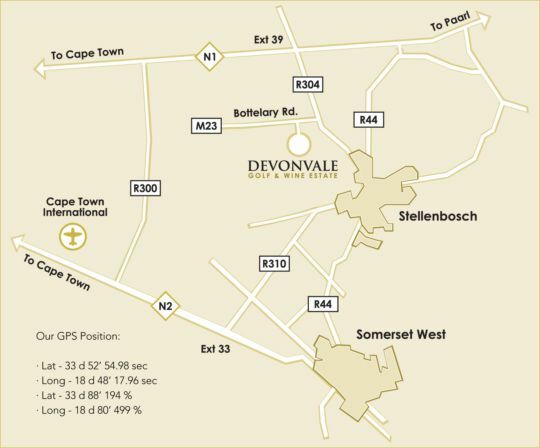 We were very pleasantly surprised by Devonvale. We used it as a stopover on a 6 night road trip. The facilities were immaculate and the trump card for Devonvale is the amazing staff. Efficient, friendly and extremely helpful. We thoroughly enjoyed the breakfast and the views that goes with sitting on the balcony. I highly recommend a hot stone massage at Revive to end off an already perfect spot. Absolutely excellent stay. Very pleased and will return! We had a fabulous stay, beautiful surroundings and lovely accommodation. Our first impression of the place was the key to a magnificent stay. All the staff were so helpful, friendly and kind. Despite the holidays they treated us like royalty. We will definitely go and stay there again.